If you have Teflon in your kitchen still, there’s a much safer non stick option! Ceramic coated cookware is a safer alternative to chemical-laden teflon, and it’s free of PTFE and PFOA. Amazon has an awesome deal today only, that can help make it affordable for you to swap over your cookware. They have a 9 pc. Copper Chef ceramic coated cookware set for just $90! It comes with a 5.8 Qt Casserole Pan with 10″ Glass Lid, 2.8 Qt Sauce Pan with Glass Lid, 1 Qt Sauce Pan, 10 ” Round Fry Pan, 8 ” Round Fry Pan, 9 X 3.5″ Round Fry Basket and a 9″ Round Steamer Tray. 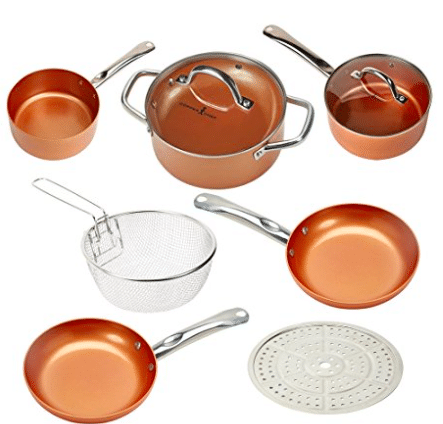 They also have smaller Copper Chef ceramic coated sets available as their Deal of the Day today, if you want to start out with just a few pieces.